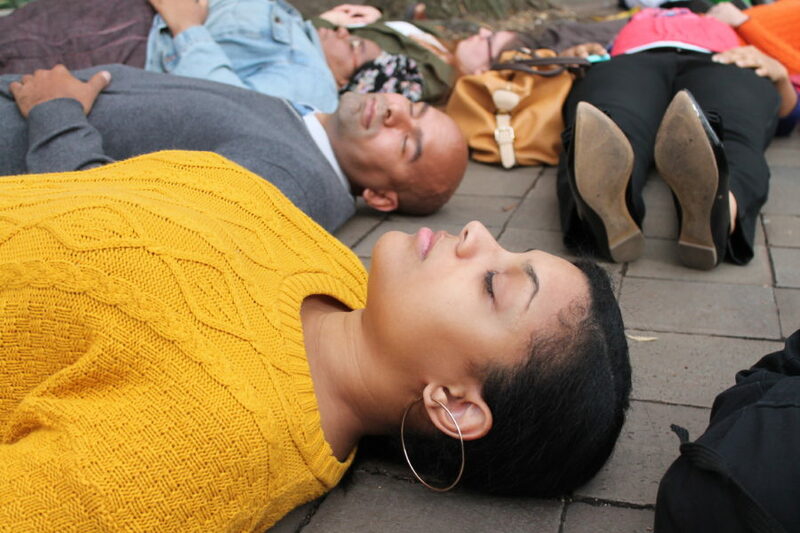 Protestors participate in a "die-in" in front of the Department of Justice (DOJ) in Washington DC on December 1, 2014 in response to the decision not to indict Darren Wilson, the white officer who killed black teenager Michael Brown in Ferguson, Missourie. Image by Elvert Barnes/Flickr (CC BY-SA 2.0)..
Micky Jones: Theologian Dr. Emilie Townes talks about “communal lament” as part of addressing injustice and eventual healing. What, as you see it, is the Old Testament precedent for lament and protest? Well, the laments in the books of Psalms and Lamentations are all an expression of grief, but they are also an expression of hope. They are an insistence that things cannot remain this way and they must be changed. Such prayers are partly an address to God, but they are also a communal resolve to hang in and take transformative action. Unless that kind of grief and rage and anger is put to speech, it can never become energy. So I believe the transformative function of such prayers is that it transforms energy and rage into positive energy. We live in a bourgeois cocoon of niceness and anything that breaks out of that is very threatening and disruptive to people. We have to work towards having honest speech with each other. When we have honest speech we have to speak out about the things that are unjust and unfair. We need a more honest and abrasive speech to bring our talk into connection with our social reality. Any intent to curb that kind of speech is a desire to not have reality pointed out to us. But if we don’t have reality pointed out to us nothing will ever change. So how do we reflect on the protests in Ferguson in relation to the protest of the prophets? The prophetic text in the Old Testament, because they are scripture and canonical, are ready for reuse. What we do when we reuse them by way of analogy is find them relevant to our analogous situation, insofar as the ancient prophets protested against injustice, violence, and exploitation (and that rhetoric continues to be pertinent in our context of brutality and exploitation). It is that kind of abrasive speech we cannot easily welcome into settled and stable society but, then again, it wasn’t welcomed the first time. I think the scriptures are important because they both model that kind of speech and they authorize that kind of speech for our use in our circumstance. There is also work to be done in study. Every revolutionary movement needs people who think and study and write and analyze. A revolution is not sustainable if there are only people on the street. You have to have what the great Italian sociologist called “organic intellectuals.” You have to have intellectuals doing the homework and background work that will sustain the movement. For people like you, who are in seminary, that is an important part of your work. Do that homework and hard head work that will sustain. As you know street protests often do not succeed. Then it becomes a question of, “How do you stay at it in the face of failure?” You stay at it in the face of failure if you have some intellectual underpinnings that will keep interpreting why we do this and how we do this. The purpose of study is to keep the movement from running out of steam. And how do you talk to professors, especially non-black professors, who may not know how to approach something like Ferguson? What do we say to them? We are all situated sociologically and economically, and we all do what we can do. I can’t ever put myself in the place of an African American or a Native American, but I can learn and I can be in touch with the reality of injustice around me. I can speak about it, and I can be instructed by people who are closer to the violence than I am. We are all in a process of being educated and learning more about our place of faith and testimony. We can’t expect everybody to be in the same place of radicality, but we can expect the people to be engaged as they are able. We need to grow and deepen our understanding. There is a lot of head work to be done but there is also a lot of dialogic interaction that is instructive for us. How do we find inspiration in the Bible for strength in protest or activism? It is in the narratives and the psalms. Beginning with the Exodus narrative and the Elijah narrative and the Jesus narrative, they are all storied about public transformation that happened by courage of uncredentialed people. These kinds of narratives feed our imagination and give us energy and courage. As the civil rights movement of the 1960s and ‘70s understood, singing is a way to keep your nerve. If you think about the Song of Miriam or those dangerous songs (many of which are in the mouths of women), we are invited to join that kind of singing which is a refusal to accept the dominant definitions of reality. Such singing and storytelling is an insistence that there is another way to experience the world and there is another way to act in the world. These are very important models and authorizations for us. You’re right. We are drawn to narrative. The scripture could just be rules and laws, but it is stories. I am drawn to those stories and songs, like the freedom songs and the protest songs. There is so much meaning in them. That is right. Many of those old songs, in their old context, really were freedom songs. If you think about Mary’s Magnificat, as it announces the themes of the Gospel of Luke, is so very revolutionary. They knew that you had to sing it out. And they did. Over time we find ways of repeating their singing. You have affirmed that it is not anti-semitic to want peace for Palestinians. However, some argue that is anti-white to want justice for black Americans. What are the connections there and how do you respond to that kind of thinking? Compensating for the defining sin of slavery requires a great deal of our public institutions and our public policies. I think reparations and affirmative action are essential if we are to get past our racial divide which is cultural and economic and political. To resist those kinds of compensatory investments is a vote for the status quo which in our society becomes increasingly intolerable. What do justice, love, and humble walking-with look like for Christians, especially white Christians, wanting to stand in solidarity with black folks? I don’t know that there is a single way to answer that. It is highly contextual. There are a variety of strategies that run from face-to-face engagement to pressure on public policy. We have to be engaged on every front because the issue is so urgent and the problems are so complex that there cannot be a single strategy. As we grow in our commitment to racial equality or social justice we have to be very imaginative. We have to find ways that have transformative potential. We have to ask what we mean by “concentrating on the Gospel.” That has to do with study and interpretation, and it obviously has to do with transformative revolutionary action. The Gospel is a very dangerous idea. We have to see how much of that dangerous idea we can perform in our own lives. There is nothing innocuous or safe about the Gospel. Jesus did not get crucified because he was a nice man. © Theology of Ferguson. Reprinted with permission of the author. Micky Jones is a student, writer, and communicator, living just south of Nashville, TN with her beer aficionado husband, KC, and their 3 creative, funny and kind children. 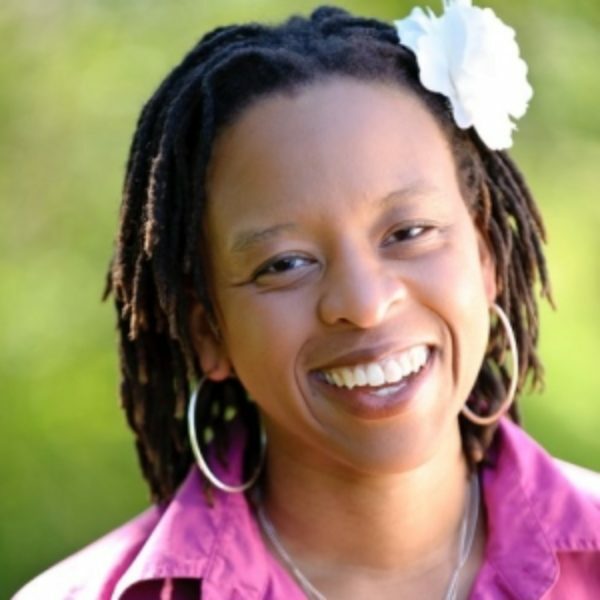 After more than 10 years as a mother-baby specialist (doula, childbirth educator, lactation consultant, trainer and author), she decided to become a theologian. She is currently studying with NAIITS (North American Institute for Indigenous Theological Studies) through George Fox Evangelical Seminary. Micky currently serves on the planning teams of the TransFORM Network and Wild Goose Festival. Her special interests include womanist theology, the intersections of Black and Native American history and theology, practical theology, nonviolent direct action, and health issues (particularly around stress, women, birth and children). Micky likes to engage in interesting conversations, participate in transformative experiences … and dance.